Little Dublin do this year will go under the footballing radar but last night's low-key league victory over Galway is already neatly filed under that heading. If Jim Gavin's team go on to win a fifth All-Ireland in a row on September 1, a frost-bitten evening on the first day of spring is unlikely to feature too prominently on the commemorative DVD. 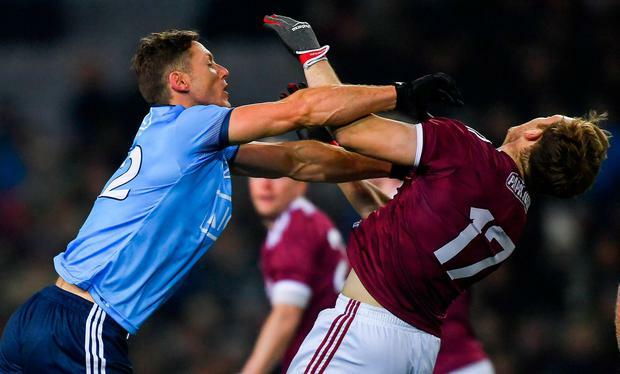 Still, a vastly superior second half, in which they kept Galway to just 0-2 and a single point from play, ensured Dublin's first two points of this year's league and spared them the fate of back-to-back league defeats under Gavin for the first time. Those who came to Croke Park did so to observe two teams with grand seasonal designs shadow-box in the wintry night. And if it wasn't a night for making a name for yourself, Cormac Costello still managed to squeeze himself more centrally into Gavin's early-season thoughts, scoring 0-6 - five from play - from centre-forward in what was unquestionably the outstanding individual performance. 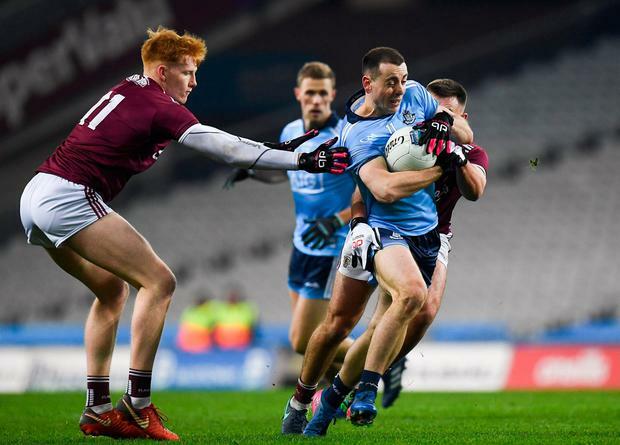 The only potential significance of the evening - Dublin losing a second league match in a row - was nipped in the bud when they managed to outscore Galway by 1-6 to 0-1 within the first 20 minutes of the restart. Costello, operating mostly at the pivot of his team's attack, and Jonny Cooper were central to most of the good things Dublin did, but Dean Rock's goal in the 57th minute officially killed the game as a contest. Not that losing a couple of matches in the frozen early part of the league would have revealed anything significant about this pioneering Dublin team. But given their remarkable win rate in the competition under Gavin since 2013, a second loss in succession with a trip to Tralee looming next Saturday would, at the very least, have represented something out of the ordinary in a season of immeasurable significance. For context, last night's was Gavin's 93rd league or championship match as Dublin manager. In that time, they have lost just nine times. Just once had they been beaten twice in a row, a succession of defeats that began with their 2014 All-Ireland semi-final loss to Donegal and ended in the opening round of the follow year's league in Cork. Unlike last week when Gavin opted exclusively for his tried and tested for their opener in Clones, the Dublin team that began in Croke Park featured two debutants. 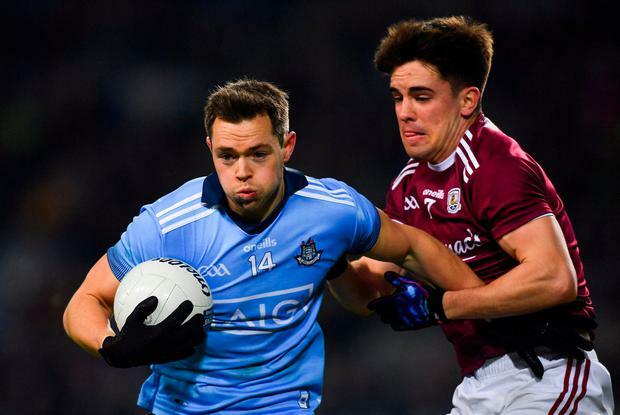 Seán Bugler, last year's Dublin under 20 captain, came in for Brian Howard, whose appearance for DIT in the Sigerson Cup this week was the Raheny man's third game in 10 days. The other Dublin change saw Liam Flatman, who sat his Leaving Cert last June, start in start in place of Michael Darragh Macauley, with James McCarthy moving to midfield in the rejig. Galway's only innovation in that first half was the occasional positioning of Thomas Flynn at full-forward but each time they tried it, Brian Fenton followed his man in. Costello's energy stood out a mile in that period and his finishing was particularly impressive in the circumstances. After Dublin had scored 0-5 to Galway's 0-1 in the first 20 minutes of the second half, a miscued shot from Paul Flynn fell enticingly between three men near the Galway square. Rock won the break and finished into the Hill 16 net for the score that rendered the remainder of the game academic. Dublin: E Comerford; E Lowndes, M Fitzsimons, L Flatman; E Murchan, J Cooper, J Small; J McCarthy, B Fenton; N Scully, C Costello, S Bugler; D Rock, P Mannion, R Basquel. Subs: B Howard for Basquel (49), P Flynn for Bugler (55), J McCaffrey for Small (61), D Gavin for McCarthy (61), C McHugh for Mannion (66). Galway: M Breathnach; E Kerin, S Kelly, S A Ó Ceallaigh; G O'Donnell, G Bradshaw, J Heaney; K Duggan, T Flynn; C McDaid, J Duane, P Cooke; P Cunningham, C D'Arcy, S Walsh. Subs: B McHugh for McDaid (h-t), G Armstrong for Cooke (63), D Wynne for Ó Ceallaigh (66).